Good news from Germany: A ‘global transformation of values has already begun’. It’s proving tough to leverage changing attitudes into sustainable behaviour – but a transition to a more sustainable society ‘would be welcomed by a significant part of world society’. In a 400-page report called World in Transition: A Social Contract for Sustainability, the German Advisory Council on Climate Change (WGBU), the heavyweight scientific body that advises the German Federal Government on ‘Earth System Megatrends’, reviewed a wide-range of values surveys. A significant majority of the German population, it found, views growth and capitalism with scepticism and ‘does not believe in the resilience of market-driven economic systems’. This post-materialist thinking is not limited to the well­-off and educated. In South Korea, Mexico, Brazil, India, and China, the report also found, a significant majority supports ambitious climate protection measures, and ‘would welcome a new economic system’ to achieve that. A key barrier to change is that value systems are often ‘abstract concepts perceived as an hypothetical area of life’. Other obstacles include a lack of long-term orientation in policy; loss aversion; path dependencies; distorted fiscal incentives; the ‘lock-in effect’ of existing systems; plus laws and institutional inertia. Seeking inspiration, the report examines how great transformations happened in the past: the abolition of slavery; the green revolution in agriculture; the spread of the internet. 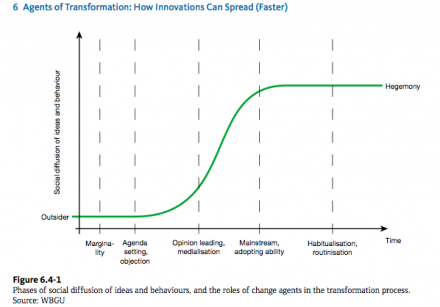 A key conclusion here is that ‘individual actors and change agents play a far larger role as drivers of transformation’ than they’ve been given credit for in the past. The most effective change agents, states the report, ‘stimulate the latent willingness to act by questioning business as usual policies’. They also put open questions and challenges on the agenda, and embody alternative practices in the ways they work. Change agents, the think tank finds, ‘tend to frequent the margins of society where unorthodox thinkers and outsiders are to be found’. Grassroots initiatives are especially important source; this is because ‘local actors can refer to context bound knowledge’ and ‘appreciate what will work under specific local conditions, and what will not’. At this point our interest peaked – but the WGBU muse fell silent: No concrete ideas are proposed. So here’s one from us: if the German Federal Government is minded to support the Doors of Perception network of margin-dwelling individuals – well, we’re minded to accept. This entry was posted in transition & design. Bookmark the permalink. Post a comment or leave a trackback: Trackback URL.